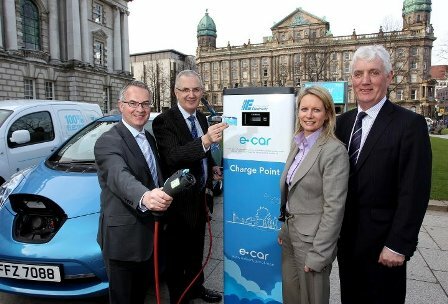 Northern Ireland’s e-car project, officially launched today by the Department of Regional Development and the Department of the Environment, provides a network of 41 publicly accessible charge points across the province. The charge points were supplied and installed by MCC Energy in partnership with Siemens for phase one of the project. “The e-car venture shows that Northern Ireland is at the forefront in tackling issues such as sustainable transport and the green economy. Siemens, as a pioneer in e-mobility solutions, is delighted to be involved in this venture with MCC Energy and Northern Ireland Electricity,” said Paul Lynam, CEO Siemens Ireland. The charge point, the Siemens CP500A, uses three phase-AC voltage at a current of 32 amps and charges at 22 kilowatts power. It has two sockets, so that two cars can charge at any one time. As well as supporting high power three phase 400 V AC charging up to 22kW for vehicles such as Renault Fluence, Zoe and Kangoo, it can charge single phase vehicles such as the Nissan Leaf, Vauxhall Ampera, Toyota Prius, BMW i3 and Mitsubishi PSA. As an established supplier of electronic traffic control systems, CP500A has been designed by Siemens to offer maximum safety and availability. It can be accessed remotely by a control/call centre to perform maintenance or reset the charger, as well as grant access to non-RFID cardholders, ensuring the charger is available to all drivers at all times. Some of the safety features include a secure flap on the power outlet which can only be released by a recognised RFID card or the electromechanical locking of the plug that prevents it from being unplugged during the charging process. “MCC Energy was very pleased to be entrusted with this contract by Northern Ireland Electricity. As we work continuously to reduce the burden on the environment and the use of energy and resources, it is very satisfying to be involved with the rollout of the charging infrastructure for electric vehicles in Northern Ireland. Together with our partner Siemens, we strived to deliver the project with professionalism and resilience,” said Joe McCarthy, Director at MCC Energy. “Rising fuel costs and greater environmental awareness added to a range of government incentives and increasing vehicle availability are allowing drivers to seriously consider investment in battery vehicles. Northern Ireland is an ideal location for electric vehicles, given the short distances between urban centres and the growing mix of renewable generation on the grid. The charging infrastructure is an added incentive for drivers to consider electric cars,” said Leah O’Dwyer, business development manager for electric vehicle infrastructure at Siemens. Siemens Traffic Solutions based in Belfast, have been contracted to perform maintenance and service for the charge points for four years. Siemens provides advanced electric vehicle infrastructure equipment and service solutions and is engaged in a number of major European projects with other leading brands, such as BMW. Siemens is a coordinator of Green eMotion, a European Union 24 million euro funded project focused on developing a Europe-wide approach to electromobility and mass market development. The project will use test regions to help define the technology, develop a baseline for standards for networks and charging infrastructure, vehicle technology and ICT solutions. Siemens is a global electronics and electrical engineering company, operating in the fields of industry, energy and healthcare as well as providing infrastructure solutions, primarily for cities and metropolitan areas. The company is the world’s largest provider of environmental technologies. Around 40 percent of its total revenue stems from green products and solutions. Siemens has been providing infrastructure solutions on the island of Ireland for over 120 years and constructed the Portrush–Bushmills railway in County Antrim, one of the world’s first electric railways. Siemens Traffic Solutions is a market leader in traffic solutions; they design, market, manufacture, install and maintain a wide portfolio of traffic management products internationally. MCC Energy, Dublin is a division of Park Electrical Services, Belfast, was originally founded in 1995 in Dublin by Joe McCarthy. Concentrating on Industrial Automation and Cable Management Systems, the business EVolved in 2009 into the EV sector. MCC Energy is now recognised as a major supplier of Electric Vehicle Solutions. Recognising the need to reduce our dependence on fossil fuels, MCC Energy now possess 2 Electric Vehicles (Nissan Leaf and Vectrix VX-1) in our fleet.